Celia (Sally) Grigsby began her journey to be reunited with her husband, Bill; son, Greg and daughter in law, Nancy, on April 7, 2019. She was born in Zamboanga, The Philippines on June 5, 1927. As a child she lived through the occupation of the Japanese and eventual liberation by the U.S. forces. 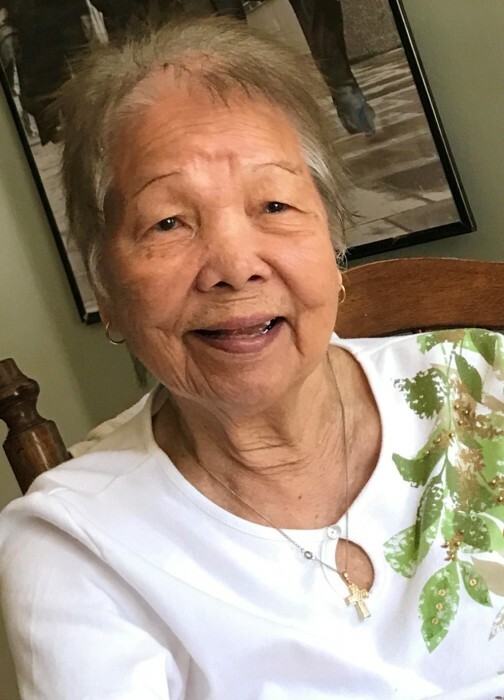 After marrying she moved to the United States and as a military wife she supported her husband and family through many moves here in the United States and eventually one tour back to the Philippines where she introduced her children to the beauty of the Philippine culture. Upon her husband’s retirement to Ft. Walton Beach in 1968 she worked for Howard Brothers Department Store for many years in addition to establishing many friendships at her church and in the Ft. Walton Beach area. She was very faithful to St Peter Catholic Church and a devoted follower of the Blessed Mother and Christ all her life. She is preceded in death by her parents, Ignacio and Maria Macrohon as well as her husband, Bill; son, Greg and daughter in law, Nancy. Sally is survived by her daughter, Marie Burns (Bill); son, Bill Grigsby; grandchildren, Taylor, Parker (Erica), Alex, Kai, and Morgan Odom (Taylor). She is also survived by her brother, Ignacio Macrohon (Frenie) in the Philippines. A Funeral Mass will be held Saturday, April 27, 2019 at 10:00am, at St Peter Catholic church, 100 Frances St., Mary Esther, Florida, with internment afterward at Beal Memorial Cemetery. The family will receive friends one hour prior to the Mass at the church. There's still time to send flowers to the Visitation at the St Peter Catholic Church from 9:00 AM to 10:00 AM on April 27, 2019.